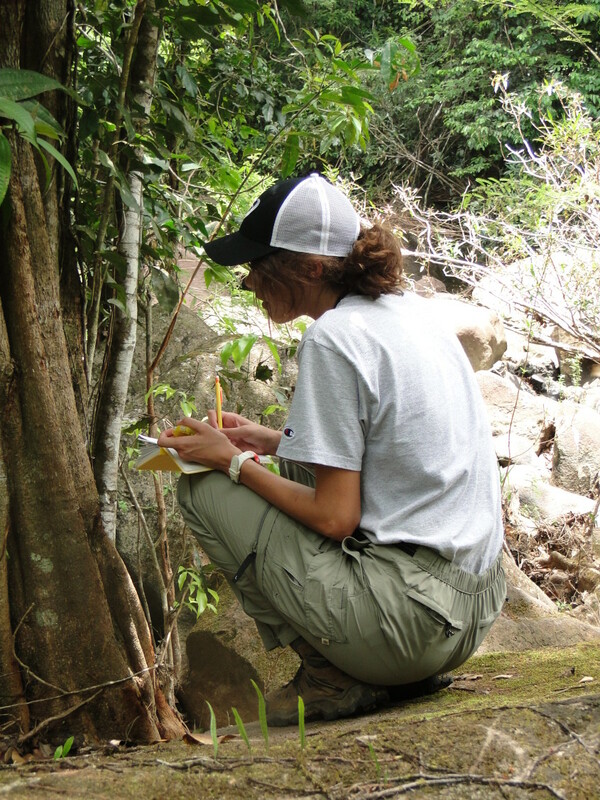 When we do field work in the Lizard Lab, we bring a backpack full of our supplies – a stopwatch, lizard-catching pole, compass, binoculars, pencil, and notebook. We then start to search for lizards. Lizards can be found up into trees, on the sides of buildings, and hidden within plants and bushes, so we have to look in all of these places. Once we find a lizard, we like to observe its behaviors and write them down in a little yellow notebook, our “field book” (as I’m doing in the picture above). For my project, it is important that I write down all of the actions that a lizard performs with their legs. So when I watch a lizard, I record all of the lizard’s jumps, crawls, runs, and push-ups (yes, push-ups!). At the end of the day, I can look at all the things that the lizard did while I was watching it. Why am I recording all of the lizard’s movements in my field book? Well, I want to know how different species of lizards use their legs. Some types of lizards, called active foragers, are always on the move looking for food. When I observe active forager lizards, I see them constantly crawling around, searching for little bugs to eat. Other types of lizards, called sit-and-wait predators, are lazier; they sit around and wait for their food to come to them. When I observe these lizards, I see them sit calmly on their perch, and then suddenly run and jump for bugs that wander by. We think that active forager lizards have different muscles than sit-and-wait lizards, which is why they are able to move in different ways. We predict that active forager lizards have muscles that have a lot of endurance, allowing them to crawl around all day long looking for bugs. We also predict that sit-and-wait lizards have muscles that have a lot of strength, allowing them to run faster and jump higher when a bug passes through their line of sight. Our field work allows us to gather information so that we can find out if our predictions are correct. Not only does watching lizards outside help us to complete our project, but it is also a lot of fun! This is why it is so important that biologists spend time outdoors! Michelle is a senior in the Lizard Lab. She is a very fast long-distance runner, and she's studying how lizards use their muscles to run. After college, Michelle is going to more school to learn to be a physical therapist.